Can anything pathogenic live in beer? The short answer is no, no, no, NO! Is that clear? There is zero chance of pathogens living in beer, wine, or distilled spirits. Period. Pathogens are organisms that are harmful and potentially life threatening to humans. There are some 1,400 known species overall encompassing viruses, bacteria, fungi, protozoa, and helminths. Of those, we are only interested in the ones that can be foodborne. Quite simply, if it can't survive in food, it isn't in beer. That knocks out all but bacteria and fungi. Viruses need specific circumstances to be passed around (e.g., on the lip of a glass or a bottle and not the beer in it). Can you say, "Aaaachoooooo!" Pathogens as a rule are very fastidious beasts, meaning that they want specific temperatures, acidity, nutrients, and other conditions to thrive. Bacteria that could live in wort (young beer) cannot survive even a little bit of fermentation. There are several reasons for this. One is the magic of hops. It is the isomerized alpha acids in the hops that provide a preservative effect to beer and also happen to inhibit pathogens! That's good for fresh wort. Another reason is the drop in pH from fermentation. In addition, yeast emit their own enzymes and byproducts, all in an effort to make the environment hostile to other creatures. The major one, of course, is alcohol, but their enzymes will break down less vigorous organisms (and they become sources of trace nutrition). Now the latter is very minor compared to the effect of alcohol, but it does exist. Most of the time these enzymes work on the wort and not organisms until late in the process. That's good for beer (and wine too). On botulism specifically: did you know that it is an anaerobic pathogen? Its toxin is one of the few that is broken down by boiling. It is also strongly inhibited by isomerized alpha acids, even in water. 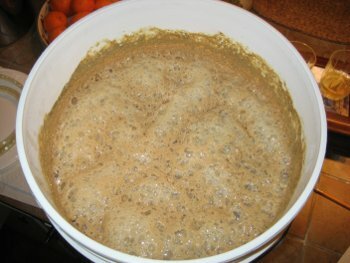 Since fresh wort has a healthy amount of oxygen in it, the beastie cannot even get started; then once the O2 is consumed by the yeast, it doesn't even have a chance against the hops or yeast. And so all that's left are a handful of acid producing bacteria that will surely ruin a batch of beer. And what we're talking about here are off flavors and aromas, nothing harmful. Overall there are less than 200 organisms that can survive in beer and lend flavor and aroma effects. None of these for very long or very often. Lambics, of course, are the sole exception because you actually want them in there. And if pathogens could survive in beer, that's where you'd find them. In lambics. And yet they're damn good and impossible to make without them! And so, yes, there are dangers to homebrewing. But they mainly involve dropping heavy things on your toes, accidentally pouring very hot liquids on your hands, or doing something stupid during brew day that gets caught on video and uploaded to Youtube. And ultimately, these harmful things are avoided if you are not an idiot and are aware of what you're doing at all times. Trust me when I tell you that it isn't the hot wort that causes the pain; it's the idiot that spilled the hot wort in the first place. Kind of like the fact that it's never the pencil that causes one to fail a test or the alcohol that causes one to get into an accident or the gun that causes one to kill someone else. The human is always the weakest link; it's never some inanimate object. It's always best to take responsibility for your actions, including the occasional bit of stupidity.